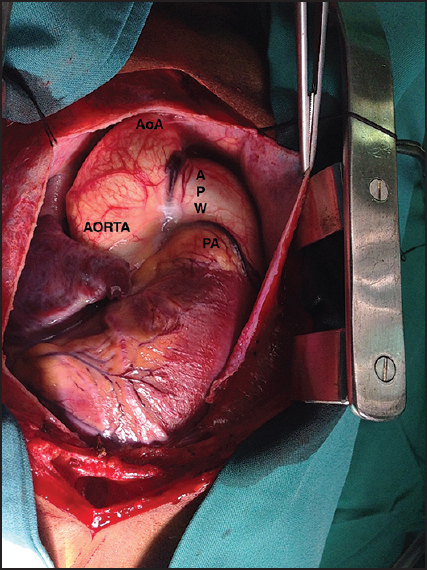 We here describe a huge APW presenting in an adolescent and suggest that use of retrograde cardioplegia offers a simple technical consideration to facilitate an expeditious and safe surgical undertaking in the given scenario. A 12-year-old male was admitted in our unit with a long history of shortness of breath, recurrent respiratory tract infections, and increased sweating. 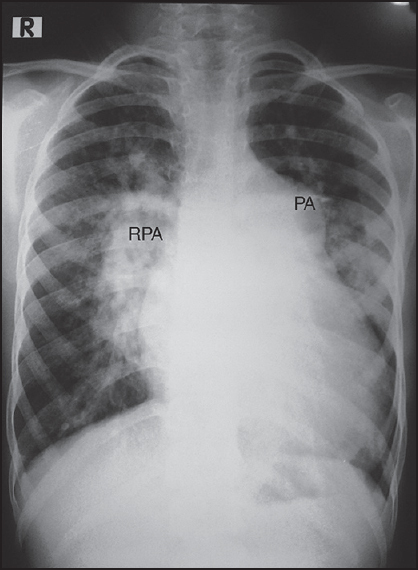 Chest X-ray [Figure 1] showed pulmonary plethora, cardiomegaly, and dilated pulmonary arteries. His echocardiography revealed a large APW shunting predominantly left to right with pan diastolic flow reversal in the arch, dilated left ventricle and pulmonary arteries, and mild pulmonary regurgitation. His electrocardiogram (ECG) showed left ventricular volume overload with left ventricular forces besides presence of q wave in lead V6. In view of his history, ECG and chest X-ray finding coupled with predominant left to right shunting and flow reversal in the ECHO, the case was considered to be operable and a cardiac catheterization was avoided. At operation we encountered a massive APW involving almost the entire ascending aorta with hugely dilated branch pulmonary arteries [Figure 2]. The size of the window necessitated cannulation of the beginning of the arch of aorta. Conventional repair in this case would have mandated snaring his tense and dilated branch PA to deliver cardioplegia, a maneuver not without risk. Additionally, existing pulmonary regurgitation had the potential to cause failure of cardioplegia delivery. Therefore, we cross-clamped the aorta immediately after instituting the bypass to prevent flooding the pulmonary circuit and administered retrograde cardioplegia resulting in quick diastolic arrest. We proceeded onto repair by anterior sandwich method. The cross-clamp time was 15 min and bypass duration was 17 min. Recovery was uneventful. Postoperative ECHO was unremarkable, but for moderately elevated PA pressure and mild PR. The patient has been discharged on antipulmonary hypertensive therapy. APW represents a malformation in the division of the aortopulmonary trunk during embryogenesis and is encountered uncommonly. The potential to cause irreversible pulmonary vascular disease mandates repair at diagnosis early in life. Beginning with simple ligation by Gross,  various surgical methods have been described and the type of repair and cardioplegia delivery method often depend upon the surgeon's preference. Location of the fistulous communication at the aortic root mandates that antegrade cardioplegia can only be delivered by snaring the branch PA, which is a rather straightforward surgical maneuver in a routine case. We suggest, however, that in case of a delayed presentation resulting in enormous dilatation of pulmonary arteries and consequent pulmonary regurgitation, retrogarade cardioplegia greatly facilitates the surgical repair and should be considered. Aggarwal SK, Mishra J, Sai V, Iyer VR, Panicker BK. Aortopulmonary window in adults: Diagnosis and treatment of late-presenting patients. Congenit Heart Dis 2008;3:341-6. Johansson L, Michaelsson M, Westerholm CJ, Aberg T. Aortopulmonary window: A new operative approach. Ann Thorac Surg 1978;25:564-7. Backer CL, Mavroudis C. Surgical management of aortopulmonary window: A 40-year experience. Eur J Cardiothorac Surg 2002;21:773-9. Gross RE. Surgical closure of an aortic septal defect. Circulation 1952;5:858-63.